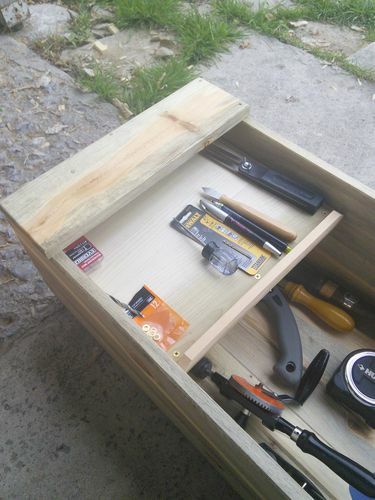 If you’ve seen my toolbox project, you may remember that I mentioned adding a tray for small tools and such. I finished it this morning. 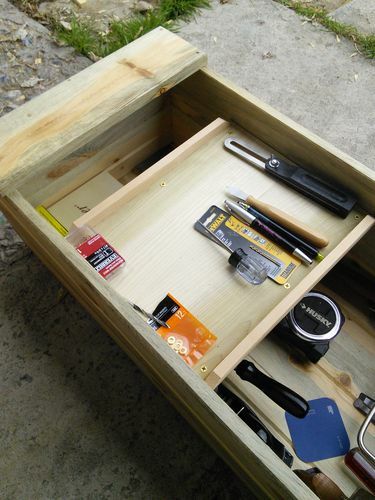 The idea of it is to make use of the grooves that already exist in the wood I used to build the toolbox in which are wedged crosspieces that would hold a tray or shelf in position. I wanted to design it in such a way that it’s not permanently attached, and can slide out of the way in case I need better access to whatever is stowed below. I used scrap wood that I’ve had laying around – thin stock poplar for the bottom, and some hemlock for the rest of it. Keep in mind, this is utterly ugly, and I’m very likely to toss it and build a new one in the future some time. I had just barely enough hemlock for the ends, if I cut them at 45 degrees then I can almost make two pieces that fit. You’ll see in the photos. The crosspieces underneath are attached to the tray using brass screws (because that’s what I had!). Three screws per crosspiece, and when you remove the other screws, the whole crosspiece swivels underneath, thus disengaging from the grooves in the toolbox, allowing easy removal. Ideally, I’d like to figure out how to do this without using any metal screws, but for now, it works fine. The whole tray slides along the groove pretty well. There’s enough friction that it’s held in place perfectly. There’s also not very much clearance above the tray and the lid (when it’s shut. I think there’s about 1 3/8”, so all my little hand tools like what you see in the photos fit just fine, but anything thicker, like a rogue chisel, probably won’t.